The HarvestChoice CELL5M Database was developed by International Food Policy Research Institute IFPRI to move multidisciplinary data underlying agriculture in sub-Saharan Africa into one harmonized, geospatial database. CELL5M was recently presented by Jawoo Koo (IFPRI) at the IGAD Pre-plenary meeting during the RDA Seventh Plenary Meeting, Tokyo (Japan). Where are the poor and what is their welfare status? On what farming systems do the poor most depend? What constraints and risks limit the productivity of those farming systems and the prospects for progress? What investments and innovations might best sustainably raise farm productivity? What would be the broader impacts of such change? Who would gain and who might lose? These are HarvestChoice guiding questions demanding availability of spatially-explicit data that are increasingly becoming available across disciplines. In order to use such datasets in a coherent analysis, such as to decide where to target specific types of agricultural investment, there should be an effort to make such datasets harmonized and interoperable. For sub-Saharan Africa (SSA), the HarvestChoice CELL5M Database was developed in this spirit of moving multidisciplinary data into one harmonized, geospatial database to support a decision-making platform for multi-disciplinary spatial econometric analysis.. In particular, HarvestChoice generates knowledge products to help guide strategic decisions to improve the well-being of the poor in SSA through more productive and profitable farming. To that end, HarvestChoice mines the latest data sources from global databases, literature, national household surveys and agriculture censuses (e.g. FAOSTAT, FAO/IIASA) using a variety of techniques, cropping system and economic models, statistical analyses, and geospatial tools. HarvestChoice harmonizes data into a standardized, geo-tagged CELL5M database (or a novel hub of geographically tagged datasets) presenting a matrix (of 10km x 10km) populated by over 350,000 grid cells covering SSA at five arc-minute spatial resolution. Examples of spatially explicit data sets available through HarvestChoice include: (1) characteristics of soil and climate and accessibility of markets and ports; (2) incidence and severity of poverty and characteristics of farm households; (3) farm production systems and area, yield, and production of major food crops; (4) potential crop yields under different technologies, practices, and climate scenarios; (5) potential distribution and persistence of major crop and livestock pests and diseases, etc.. The CELL5M platform allows more fine-grained visualization of the enormous mix of farming, cultural, and socio-economic conditions that exist across Africa. Beyond Big Data, HarvestChoice also offers interactive tools (for example, Mappr & Tablr) for users to craft their own scenarios by manipulating and overlaying actually over 650 agricultural indicators of their choosing. Mappr interacts with HarvestChoice’s core collection of gridded data to better visualize and analyze the spatial distribution and patterns of farming and households in SSA. HarvestChoice’s core includes over 650 layers of data, including population density, poverty, rainfall, crop harvested areas, and travel time to market. Mappr allows users to home in on any one of 350,000+ grid cells or to aggregate cells for a specified watershed, agroecological zone, or market area, allowing users to combine indicators from multiple layers to produce customized maps, charts, and tables. Tablr performs many of the same functions but includes more tailored chart capabilities and also serves as a more intimate interface for more advanced users. CELL5M also provides standard-compliant HarvestChoice data API that currently powers several web-based data visualization and analytics tools. Through this API programmers can access data and methods to describe, query, and aggregate data to suit their own purposes. HarvestChoice knowledge products - including tools, maps & data, and publications - are openly accessible and free to the public through the user-friendly website: harvestchoice.org. 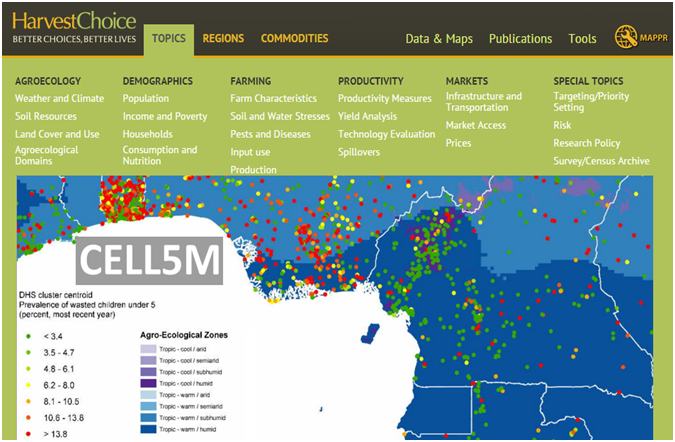 Besides agricultural indicators, the CELL5M database comprises also over 750 biophysical and socio-economic indicators (many of which can be easily expanded to global scale) and provides a platform for cross-cutting spatial analyses and fine-grain visualization of the mix of farming systems and populations across SSA. Users of the database - including those conduct researches on agricultural policy and development issues - can also easily overlay their own indicators. Numerical aggregation of the gridded data by specific geographical domains - either at subnational level or across country borders for more regional analysis - is also readily possible without needing to use any specific GIS software. The Spatial Production Allocation Model (SPAM) uses a cross-entropy approach to make plausible estimates of harvested area, production, and yield within disaggregated, gridded units. Covering 42 crops and growing, SPAM reveals spatial patterns of crop performance at the confluence of geography and farming systems. The CELL5M would enable development practitioners and researchers to explore multi-faceted spatial relationships at the nexus of poverty, health and nutrition, farming systems, innovation, and environment. agricultural technologies in Mozambique (slides, IFPRI, Harvest Choice). Global High-Resolution Soil Profile Database for Crop Modeling Applications (working paper, Harvest Choice).